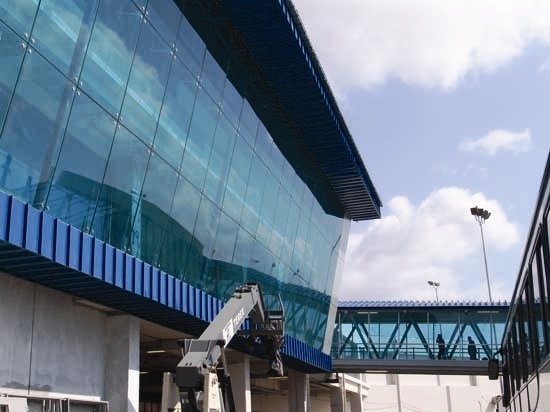 In today’s La Prensa, the daily newspaper in Panama, there is an article about the growing challenge that alcoholism is causing in the city centers. It’s estimated that 5% of the homeless are alcoholics and that number appears to be rising. The story captures the struggle and journey of one man in particular. My heart felt this story. Speaking of his daughter’s invitation to live with them and get cleaned up, he says. This morning, my prayers are focused on this man and on the many like him, who perhaps don’t realize that it’s not hard to find the Lord. Lord, send the church, send the workers into the harvest. The intercessory burden is clear. It is our calling to help equip the church to help men and women like this, to help them find people and share the good news of the love of Jesus, to help folks find forgiveness and the strength to pursue transformation and be transformed. Walking through transformation is difficult. Finding the Lord should not be. Who shall go to the harvest field that is ripe? Over the last few days, we’ve been praying specifically for provision for a couple of things. Today as I sit in the airport, leaving to teach a conference in Florida for pastors, we want to report on some blessings. Bank error in our favor, collect $2700. The offer of provision for our family’s airfare to VZ. An invitation to a small group, we can walk there and our kids are welcome. Two more churches have added our ministry to their monthly mission gifts. We’ve seen other evidences of God’s hand of care and concern. HP will repair my out of warranty laptop for free. Free lodging while in Tampa FL. A cell phone that fell in the toilet continued to function. We thought our fridge motor had burned out — it was no longer cooling. We unplugged it, pleaded with God for mercy and replugged it in. It functioned. Thankfully, the food didn’t spoil either. My faulty laptop wireless card worked yesterday when it was needed. Continued safety as we travel. We give thanks to God for His blessings. Living on the edge by faith is a razor edge away from failure. Yet often, we see God’s provision and sustenance. Regular newsletters are very important in our work. Many of our readers automatically get our newsletter by email. 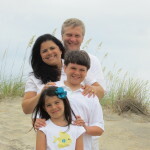 Newsletters allow us to stay in touch with supporters and to share special needs and prayer requests; they are a vital lifeline between congregations back home and our mission field. They also allow congregations to see and understand what God is doing here in Panama and in our ministry in Latin America. Normally, we use an email newsletter to keep you informed, and likewise, you can also stay informed on the website automatically Subscribe to the feed a reader or Subscribe by email. We are in need of a person or a small group to take on the role of printing out and mailing our printed letters. We have supporters who do not use email, or even computers, and as such, we need to get printed materials in their hands. The postal system here exists, but functions nothing like the US Postal service. To post something from here to the US is not very efficient, timely, or cheap. One of the many ways you can help support us is by helping to publish our newsletter. Publishing a missionary newsletter to our entire list involves a fair amount of effort. At this point, we plan only for those few who do not use email, so we expect that the workload will be small. We also invite a limited commitment of 12 months so that it is not a permanent responsibility. Lives change so we don’t expect you to take this on forever. 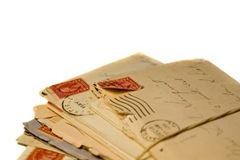 We will send you a 8×11" letter ready to print, stuff in an envelope and mail. Sometimes it’ll be more than one letter, other times it’ll just be one. Occasionally, we’ll ask you to put our photo in there as well (we will have 20 printed for you at your local Walgreens, CVS, or Sam’s club for you to pick up). Would you consider helping us in this way? Doesn’t matter where in the US you are. As long as you can color print and stamp a letter for us as needed, this would help us greatly. Simply contact us to volunteer, or reply to the email pitch that we have sent you. 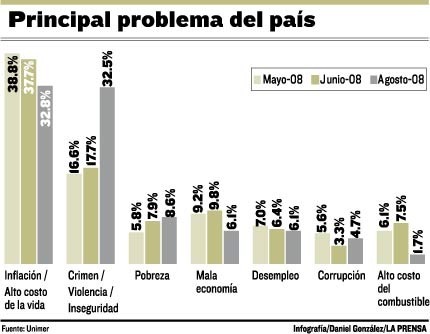 According to La Prensa (Sept 17, 2008), the number one issue in the mind of Panamanians, described as their "pain in the head" is inflation. In a survey of 3,021 responders, 33% had inflation as their number #1 concern. Though down from 38% in 3 months, it remains the #1 issue. The second issue (32.5%) is crime. That has shot up from 16% 3 months ago. All other issues polled, such as poverty, bad economy, unemployment, corruption, and high cost of fuel all under 9% of the results. I’m not an economist, just observing what I see and wondering what that suggests for our ministry in Panama. I don’t understand how it’s all tied together with the growth in the construction industry, the speculative housing / condo market (which continues to expand). Though the local economy is growing, it is may be beginning to face a credit crunch as well. Banks are not giving easy credit like they used to. In fact, those that can’t prove an income of $500 a month will no longer qualify for a card (according to La Prensa last week). One February article on consumer debt looks at this item: Panama banks overexposed on consumer loans. Interest payments in 2007 totaled $2.7 Billion for a country that has only 3.2 million people (July 2007 figure). That is about $843 per person. Seems small, but take out those that can’t get credit (I have no idea how to compute that figure) and the number must be a whole lot higher. the continued threat of increased bus fares. Taxi fares have already gone up considerably. I don’t hear complaints about being in debt. Yet, I’m not aware of salaries growing similarly to compare with cost of living increases. Inflation and crime — that is what is on the mind of people as best as I can tell. This suggests to us what fears and anxiety reside in the mind of many. What can the gospel say to such fears? What can the Bible say about managing your personal economy (finances) and debt? How can a person have peace of mind in the midst of such external stressors? How can a person find the peace of Christ in this? How can people experience the joy of a full life? What role does sin play on both a personal level and on a regional level? These are simply thoughts that run in my mind. 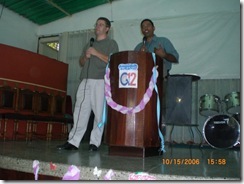 conducting 2.5 hour workshop on Evangelism on Friday 03 October at "la Iglesia Buenas Nuevas Shekina"
preaching at a church on 05 October. 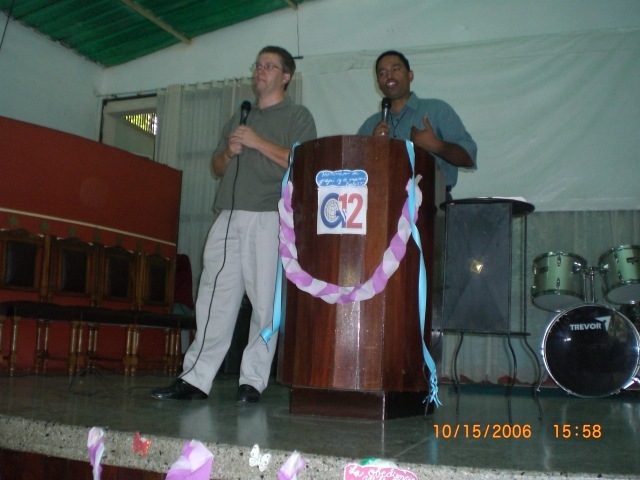 My missionary friend (standing next to me) will provide translation for me during the workshops and preaching to allow me to focus all my Spanish preparation on my friend’s wedding. That is a mental relief and gives us a chance to minister together again. We will travel home on Monday the 06 of October from Venezuela, and on the 7th, I will leave for Palmer Alaska to teach an evangelism seminar. Provision of funds for the trip to Venezuela. Fluency to communicate in Spanish. Rest even with all the travel.